The seven-storey LEED-Gold complex will include 160,000 square feet of Class-A office space designed for the creative and digital media environment. It will include a rooftop deck, fitness centre, a 2,000-sq.-ft. ground-level retail pavilion and a 20,000-sq.-ft. public plaza. The project, being co-developed by PCI Developments and Low Tide Properties, is nearly three-quarters leased and is set to open by this summer. It is the first multi-tenant office building in the area in 18 years, and the first of nearly two million square feet of new density that is being planned for the neighbourhood following the approval of a broad rezoning plan of False Creek Flats by City Council in the fall. 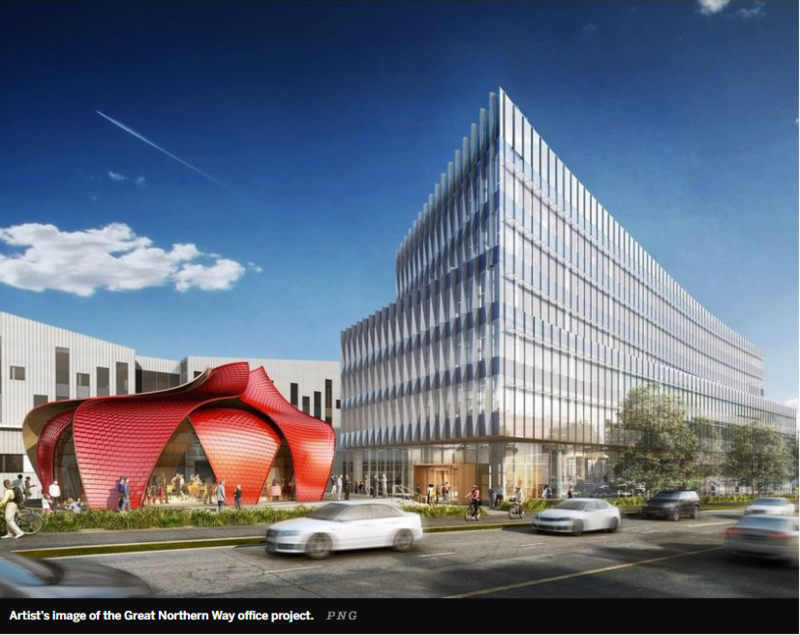 “This is big news for a city that now has the second-lowest downtown office vacancy rate in North America and limited new supply coming to market,” said Blair Quinn, an executive vice-president at CBRE, the listing agency for the project. “This adds significant supply to an emerging neighbourhood,” he said. Finning International will be moving its global headquarters from downtown Vancouver back to False Creek Flats, occupying 29,000 sq. ft. in the new building for several of its business streams. Finning was founded in Vancouver in 1933. “We had about 7.3 hectares of property down there (on Great Northern Way) that we opened in 1964,” said Dave Cummings, Finning’s chief information officer. Finning donated the land to the Great Northern Way Trust, which is overseen by UBC, BCIT, SFU and Emily Carr University. PCI and Low Tide eventually purchased a plot of land from the trust and are now bringing Finning back into the fold, where its corporate headquarters, Canadian operations group and Finning Digital will all operate under one roof, Cummings said. He said Finning will have about 180 staff working in the new space. Blackbird Interactive Game Studio will also move from a nearby space into a 29,000-sq.-ft. unit in the building. Spaces, a co-working company, leased another 39,000 sq. ft., and Samsung took about 20,000 sq. ft. Others will be announced soon. PCI and Low Tide purchased the property from the trust in 2016, said Tim Grant, vice president with PCI Developments. He said they are aiming for a mix of local and global tenants. “When we sat down with the trust early on and started talking about what our plan was, I think we all hoped it would be the types of names we’re seeing, and we’re really pleased,” he told Postmedia. Great Northern Way would benefit from having more people and more animation around the Emily Carr campus node, Grant said. He said the fifth and sixth floor of the building remain available for lease. The city ultimately aims to increase the number of jobs in the 450-hectare False Creek Flats area from around 8,000 to 30,000 over the next three decades, fuelled mostly by the future St. Paul’s Hospital, as well as the new Emily Carr campus. The plan for False Creek Flats, which is bordered by Prior and Main streets, and Clark Ave. and Great Northern Way, aims to prioritize job-creating development. Quinn said the area is already changing as tech companies look for larger alternative spaces beyond Gastown and Yaletown. “The (downtown) core is filling up and the tech sector has become a lot larger of a dominant factor for users,” he said. “The deal we did with Hootsuite five years ago to Mount Pleasant really woke the market up to alternative areas. He said as many as eight companies could end up in the new building. “More product is coming and this area will be a very sought-after tech cluster amongst the creatives and the types of companies that are there today,” Quinn said.